I’ve made some enlargements of details. I love the earnest expressions and neatly combed hair. I’ve always wondered what became of all their instruments. Did they take them with on the journey, or are they still at Bag End? “The Unexpected Party” is an example of how John Howe creates a sense of authenticity in fantasy worlds by careful research. Just look at those instruments, and the precise way in which the musicians hold them. That last phrase sums up what attracts me to his work, where so much fantasy art leaves me cold. His careful observation and research results in a world that is rooted in the familiar. 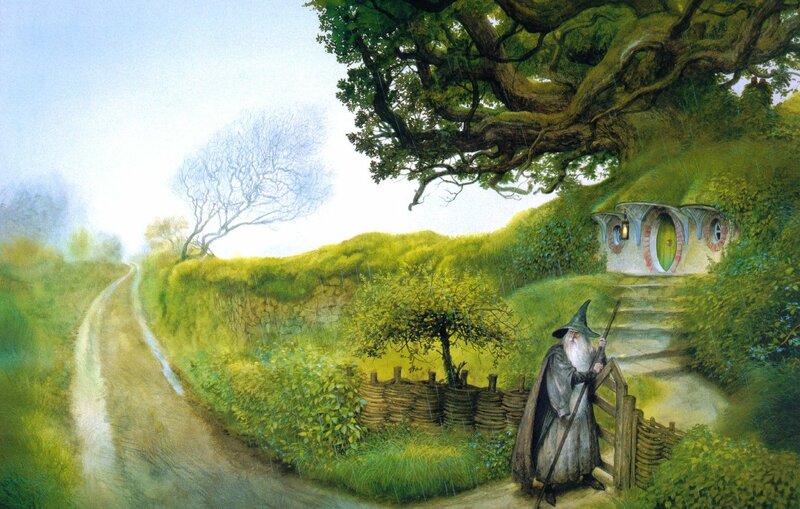 The same forces of nature and history work on Middle Earth as on our world. What a beautiful and thoughtful post on Howe’s art, Masha! (Yes, I fail at comments. ^-^; ) But truly, it’s a heartwarming post to read, and not just because the art is beautiful.